It’s summer…and I’m broke. Why am I broke? Because…it’s been hot…and my air conditioner has been rocking and rolling. Also…food prices are on the rise. And…well…I just have a difficult time living within my meager food budget when I have to eat the way that I do. Being that I am very broke at the moment, I opted not to purchase the extra container of vanilla Greek yogurt this week to make my overnight oats…because I had a box of gluten-free oatmeal waiting in my pantry. No time like the times you have no expendable income to clear out the pantry some, yes? But, now I’m glad I sort of made that decision. I get really excited when I see new products, especially ones that I know I’ll eat…eventually. And we all know I eat something oat-y for lunch every day. Well, this week…it’s been Nature’s Path Organic Gluten Free Hot Oatmeal…the variety pack…which gives a couple pouches of each flavor out on the market, so you can try it and if you don’t like it, you have maybe one or two more pouches to use instead of an entire box. The three flavors that are included in the variety pack are: Spiced Apple with Flax, Homestyle, and Brown Sugar Maple with Ancient Grains. And…wouldn’t you know it…I chose to sample them in that very order. I started my foray into the Nature’s Path Gluten Free Hot Oatmeal with a bowl of the Spiced Apple variety. Now, I’m quite particular about my hot cereal. I want it at a certain consistency…and it has to wow me with flavor. It has to really win me over. And it has to still maintain the integrity of the product…meaning, I don’t want it laden with sugar. I want something that will stick with me…fill me up…do exactly what a hot cereal is supposed to do. Nature’s Path Organic Gluten Free Spiced Apple with Flax Hot Oatmeal does just that. Made from gluten-free, rolled and uncontaminated whole oats, this blend contains dried bits of apple and a little dash of cinnamon. The glax helps add a bit of fiber to the mix, helping to fill you up and keep you feeling full. It’s super easy to prepare too. I go the microwave route, because I eat this at work and we have no stove. So, I simply pour the oatmeal into my bowl, add about 2/3 cup water and microwave for around 75 seconds (1 minute 15 seconds). When it emerges, it’s steamy and has this nice creamy texture without having gone all to mush. No one likes mushy, soupy oatmeal. It cooks to perfection. And I love how the apples sort of soak in the water and become reinvigorated. They lend a nice bit of natural sweetness to this variety. I wasn’t sure about it on the first bite. I thought it might be a little bland…but the next bite brought more flavor…and the same thing with the next. And soon, I had devoured my whole bowl and was spooning at the little bits left in the curves of the dinnerware. Ingredients in Nature’s Path Organic Gluten Free Spiced Apple with Flax Hot Oatmeal include organic gluten free rolled oats, organic evaporated cane juice, organic dried apple, organic flax seeds, organic flavor, organic cinnamon and sea salt. This oatmeal is not only gluten-free but also cholesterol free. As far as the nutrition information goes, a serving is one packet of the Nature’s Path Organic Gluten Free Spiced Apple with Flax Hot Oatmeal. This packet will give you 170 calories and 2.5 grams of fat. You will also be taking in 90 mg sodium and 9 grams of sugar. It’s sort of on the…iffy on the sugars line as to whether it’s too high or not on that count. In addition, you will be consuming 4 grams of fiber and 4 grams of protein. So, yes…it does make you feel full. Gotta love that. I know I do. I admit, this was the packet that I was the most leery of when I opened up this box. Why? Because traditional oatmeal and I don’t always get along. Sometimes it can be rather boring and bland. And I was more than a little concerned that would be the case here. Also…I was taking it in on the day that the office was having lunch catered by a bbq restaurant…which was meat and gluten…so not for me. While my boss, that morning, said she’d be happy to purchase something for me from one of the restaurants nearby…even if it was just a salad…I told her I had my oatmeal with me…and that was fine. I sure hoped it was going to be okay…because I was stuck eating it regardless. AND…I opted not to bring anything to mix into it. No raisins, no berries…not even brown sugar or maple syrup. Nope. I needed to try it on its own…and was definitely rolling the dice on this one. Same cooking as the other packet…bowl, water, microwave for 75 seconds…enjoy! 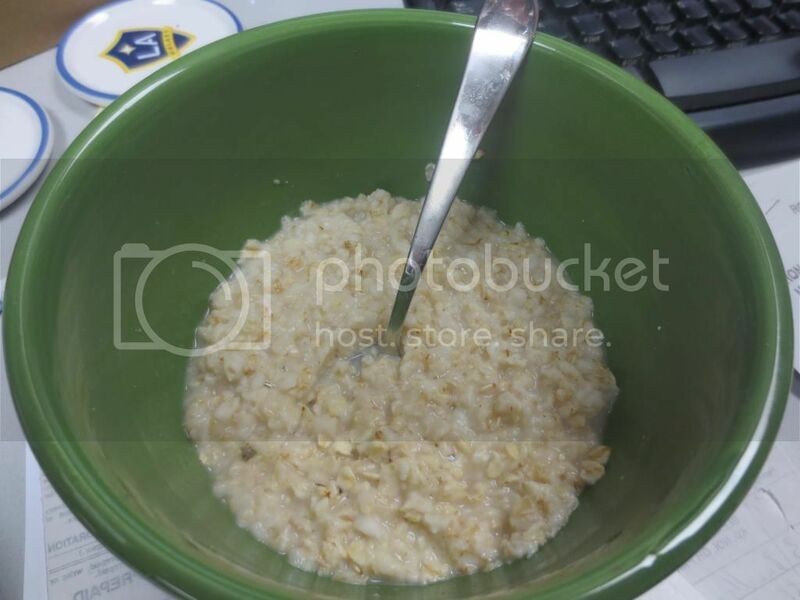 For an oatmeal that is nothing but rolled oats…this one amazed me. This one impressed me. It wasn’t bland at all. In fact, it had this tiny hint of sweetness to it, without all the added sugars. The oats were definitely perfect. I didn’t give raisins or syrup or fruit a second thought when I settled into the lunch meeting with my bowl and sent up prayers to the gluten-free lunch gods that I could at least get through this bowl. I had no problems and found myself devouring the oatmeal faster than I intended. That’s saying something! Ingredients in Nature’s Path Organic Gluten Free Homestyle Hot Oatmeal include organic gluten free rolled oats. Yes…that’s all. And yes…it really is delicious. It may seem plain, but there is nothing plain about this variety. It is gluten-free, cholesterol free, and sugar free. Speaking my language! As far as the nutrition information goes, one serving is one packet of Nature’s Path Organic Gluten Free Homestyle Hot Oatmeal. This packet will serve you 170 calories and 2.5 grams of fat. You will be taking in 0 mg sodium and 0 grams of sugar. In addition, you will be consuming 4 grams of fiber and 6 grams of protein, leaving you feeling full for longer. Yes…just…yes! Trust me…this is really good. Not bland. Not plain. Not lacking in anything but the stuff you don’t need to be feeding your body anyway. Before I really expanded into the hot cereal world, growing up I would add brown sugar to the Malt-O-Meal (something I definitely can’t eat anymore!) my dad would cook up for breakfast sometimes. This was a go-to whenever my mom wasn’t able to make breakfast or was out of town or something. 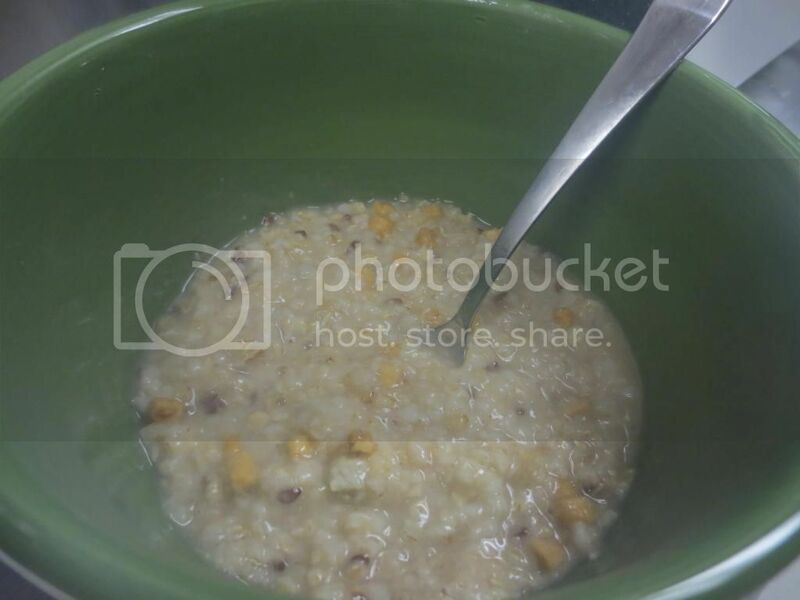 When he was in charge…he opted for his favorite hot cereal. Malt-O-Meal. 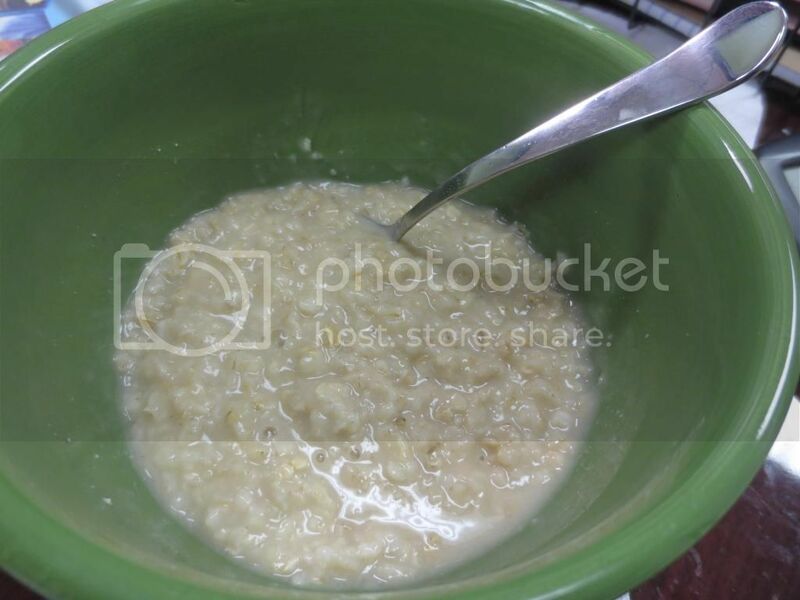 The thing was…growing up I hated hot cereal. Hated it. I ate my cold cereal dry…no milk. So when I started giving hot cereal a try as an adult…I did it cautiously and started with something familiar. Something with brown sugar. From there, I expanded to other flavors, but if given the choice…old habits die hard…I always opt for the Brown Sugar variety. I think that’s why I usually save that version for last. It’s just…ingrained in me. Same as everything else…empty packet into bowl, add water, nuke for 75 seconds…consume. This one was good. It was really, really good. Homestyle, I think is still my favorite of the three…but this one is a close second. The sweetness of the brown sugar and maple syrup is a nice way to really perk up oatmeal. The texture on this one was a little soupy…but I might have added a little too much water when measuring it out. Hard to say. But…it sat for a moment and those oats just soaked it up. It was nice and sweet and delicious. And I savored each bite…wondering how it was I used to dislike hot cereal…except when I mixed brown sugar into it. Well…this one is a sentimental favorite for sure…but, honestly, the flavor is nice. Not too sweet, actually…but not bland. The right balance with the right consistency. Impressed. Ingredients in Nature’s Path Organic Gluten Free Brown Sugar Maple with Ancient Grains Hot Cereal include organic gluten free rolled oats, organic brown sugar, organic evaporated cane juice, organic rolled amaranth, organic rolled quinoa, organic sorghum flour, natural flavor, and sea salt. It is gluten-free and cholesterol free. As far as the nutrition information goes, one serving is one packet of Nature’s Path Organic Gluten Free Brown Sugar Maple Hot Oatmeal. This packet will serve you 160 calories and 2 grams of fat. You will be consuming 80 mg sodium and 8 grams of sugar. In addition, you will be taking in 3 grams of fiber and 4 grams of protein. Don’t let that drop in number hinder you…this one is also very filling. In fact…I felt my fullest after eating this one. Odd! 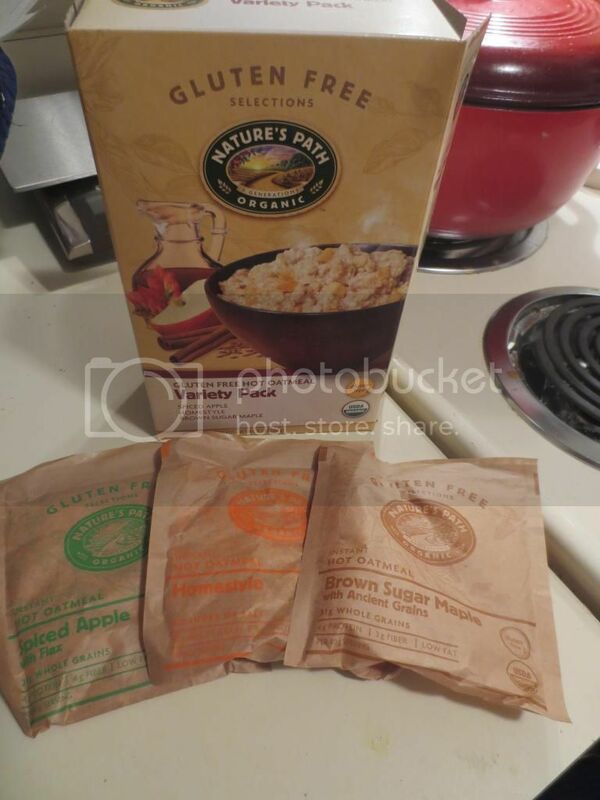 So, if you are wanting an easy-to-make and easy-to-eat option for breakfast, lunch or even dinner…I highly recommend Nature’s Path Organic Gluten Free Hot Oatmeal Variety Pack. You get a little bit of everything to try and you can choose what you prefer when it comes to the flavors out on the market. It’s a great value at a great price. Beyond impressed. I’m sure this will find its way into my pantry again. This entry was posted in Breakfast, Cereal, Clean Eating, Food, Fruit, Gluten-Free, Oatmeal, Products, Quinoa, Review, Sweet Stuff, Vegan, Vegetarian by The Celiathlete. Bookmark the permalink. I’ve been wanting to try these. Thanks for sharing!